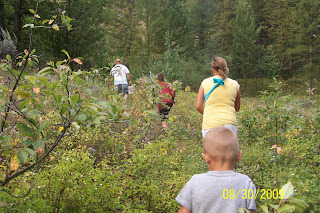 Our family loves to be outdoors (well some of us)! 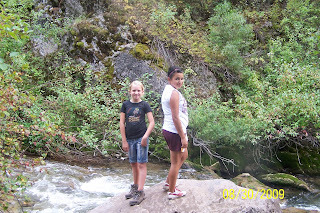 So after church we went on an adventure. I call it that because something funny, scary, or crazy all ways happens to us. 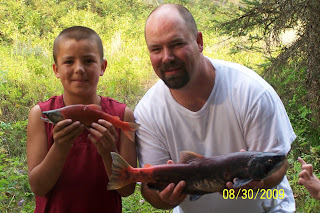 We loaded the fam into the pickup and headed to Big Elk Creek to catch some Kokanee. (Fish) They are very pretty a bright red color, and very easy to see in the water. 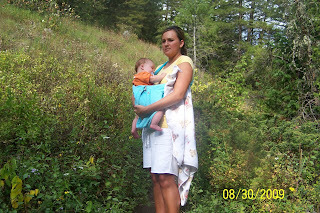 We had to hike a little farther than expected and no we didn't bring a pack for Dawson. He's tipping 20lbs these days. Yes, I carried him for the most part. We made a sling from my hoodie which saved us big time. I'm sure Jeff and Dakota had the most fun of all. 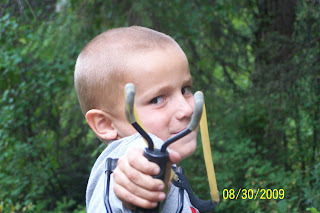 Ki had a slingshot and he was going to protect us if anything happened. Like Bigfoot!!! He always make thing so much fun. A very funny kid. On are way home! Can't wait for the next Jeppesen adventure. Stay tuned!! !